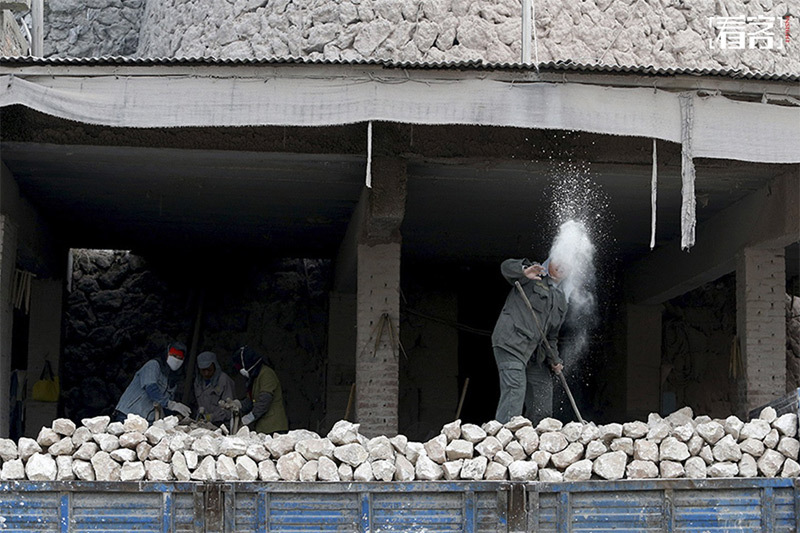 2 The terrible employment conditions of the stone workers in China. 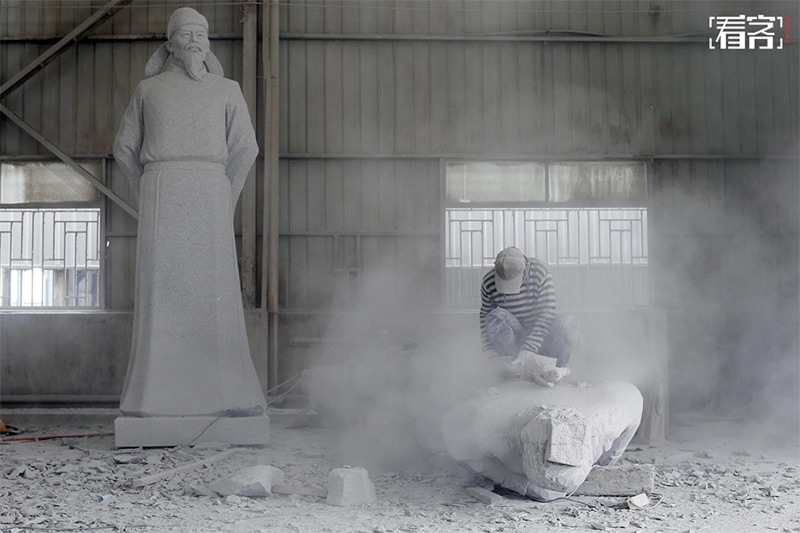 The terrible employment conditions of the stone workers in China. 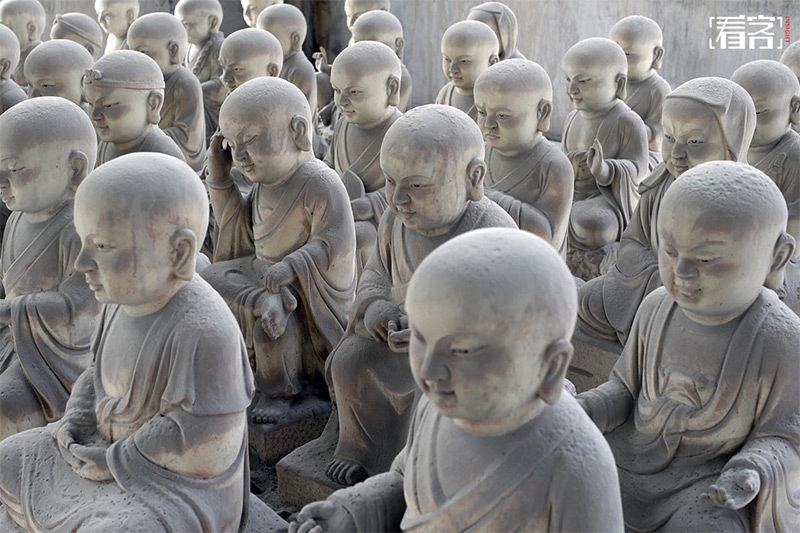 Hui’an, known as “stone town” in Fujian, is famous in China for the production of Buddha statues. 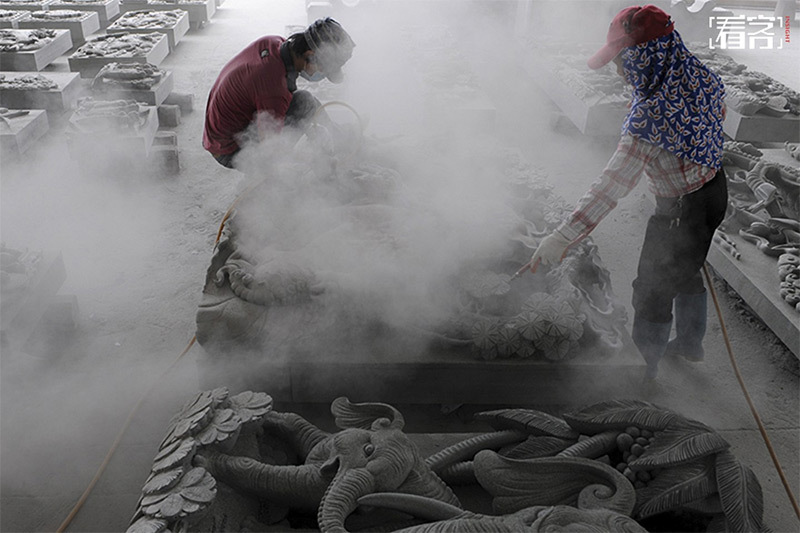 The production of dust is one of the consequences of working with stone. The lack of professional protective equipment, caused in workers, in the long term, the onset of tumors and diseases like pneumoconiosis. 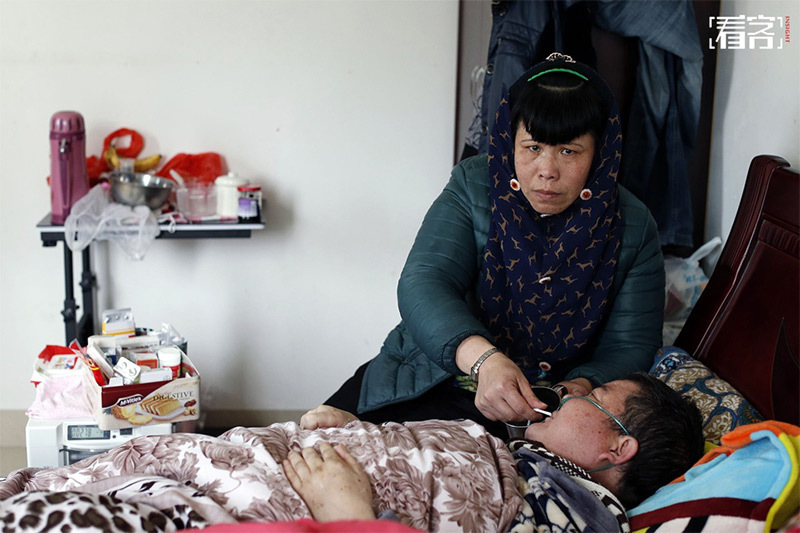 Just as Hui’an workers in other provinces there are people forced to live in a dusty world. 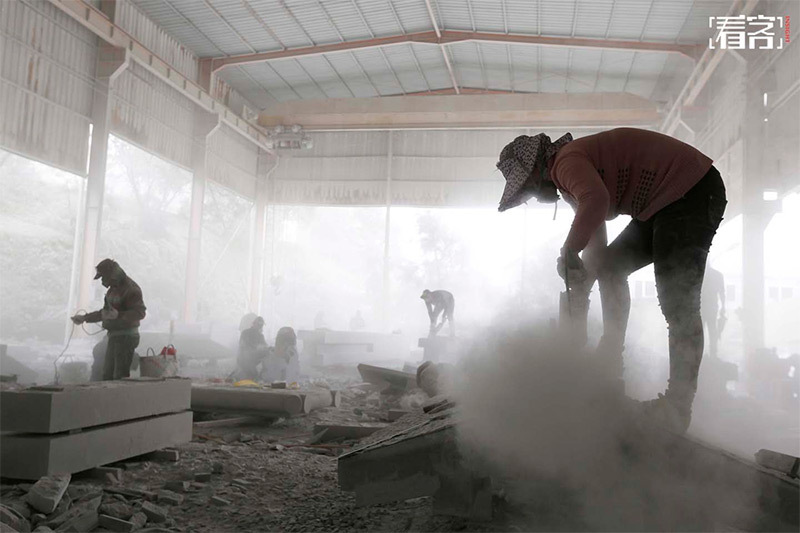 March 30, 2016 – Inhaling dust causes toxic effects on the respiratory system. 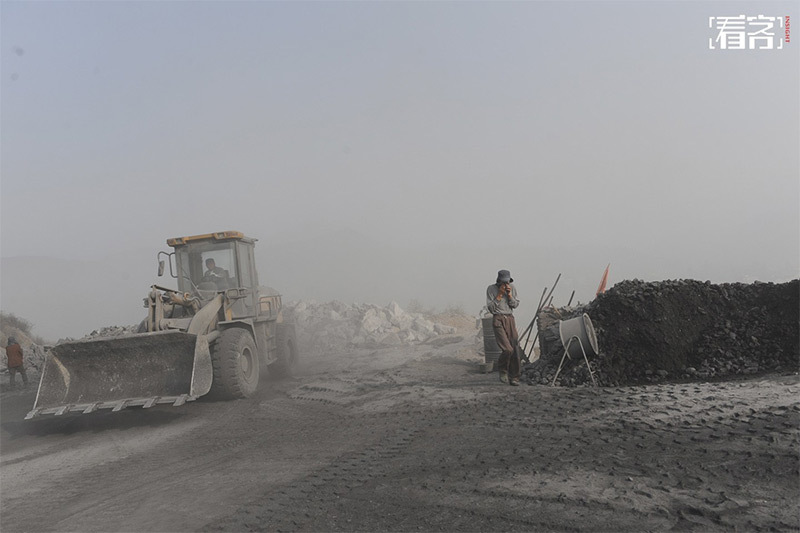 Occurrence of respiratory and skin problems among manual stone-quarrying workers is very high. 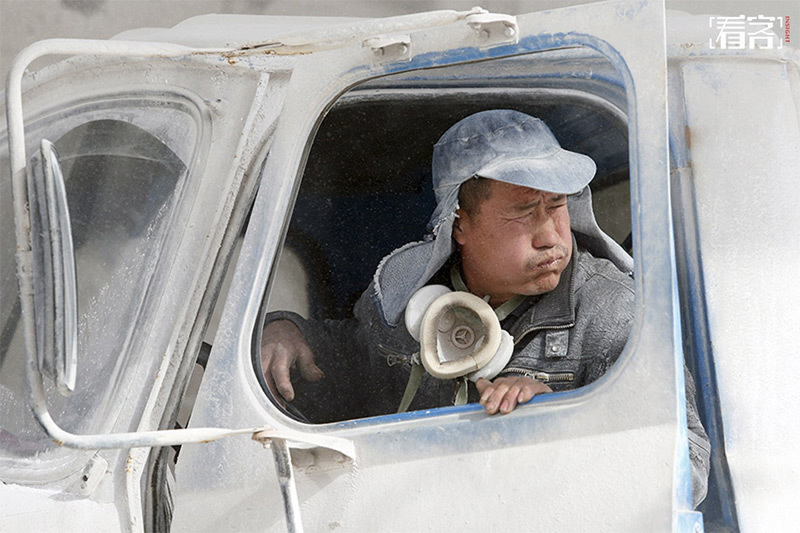 dust particles, and is generally characterized by those particles arising from silica and coal mining industries. 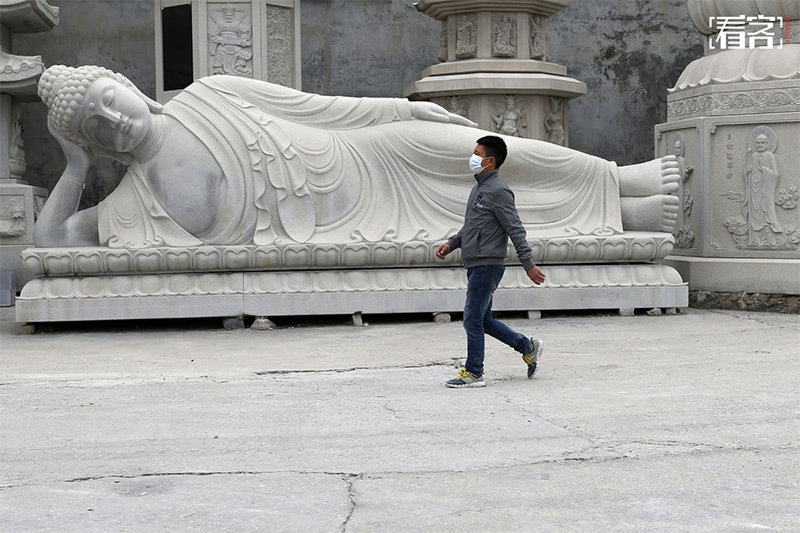 In Hui’an, cases of Pneumoconiosis were very high. 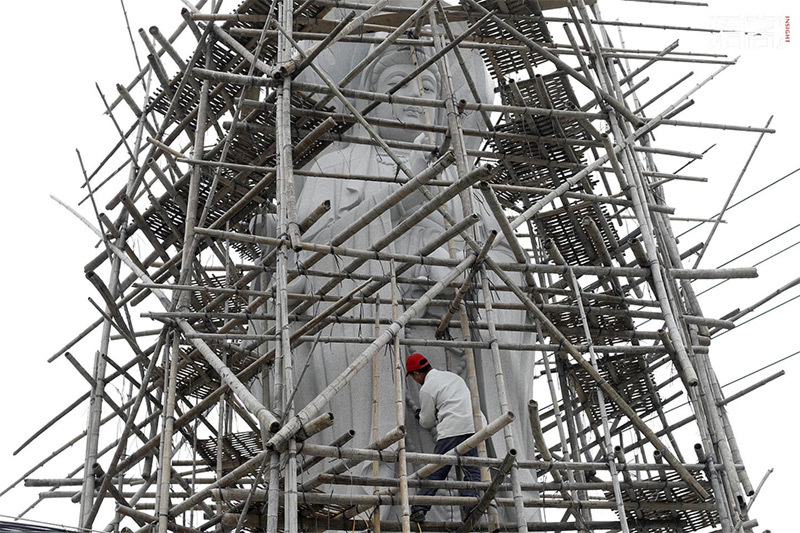 March 30, 2016 – Working on a Giant Buddha. 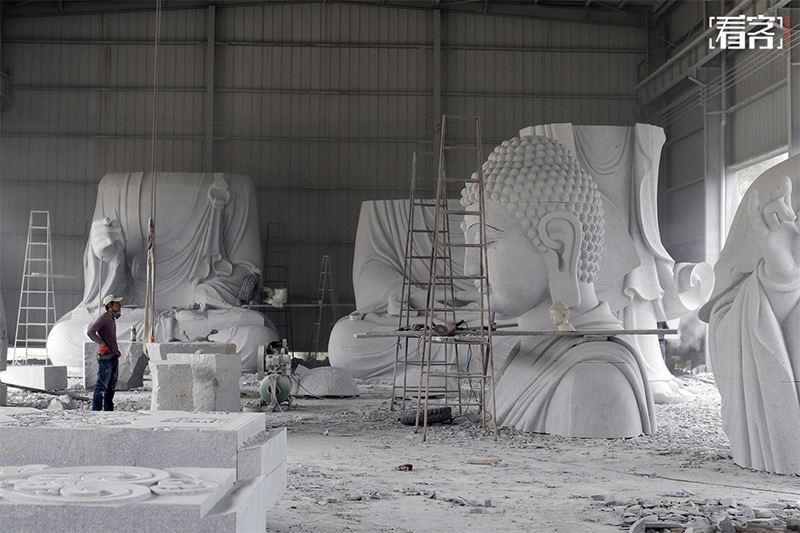 Chongwu stone carving factory, a worker wearing masks in front of a giant reclining Buddha statue. 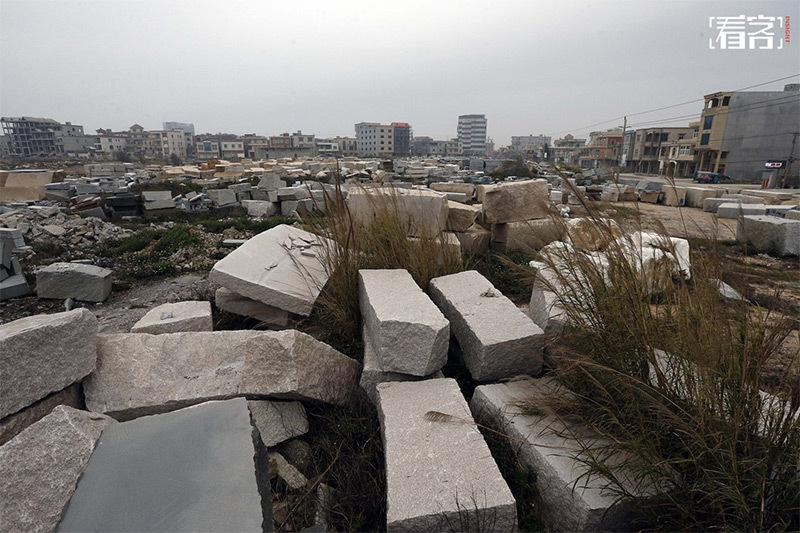 In Chongwu, piles of stone everywhere. 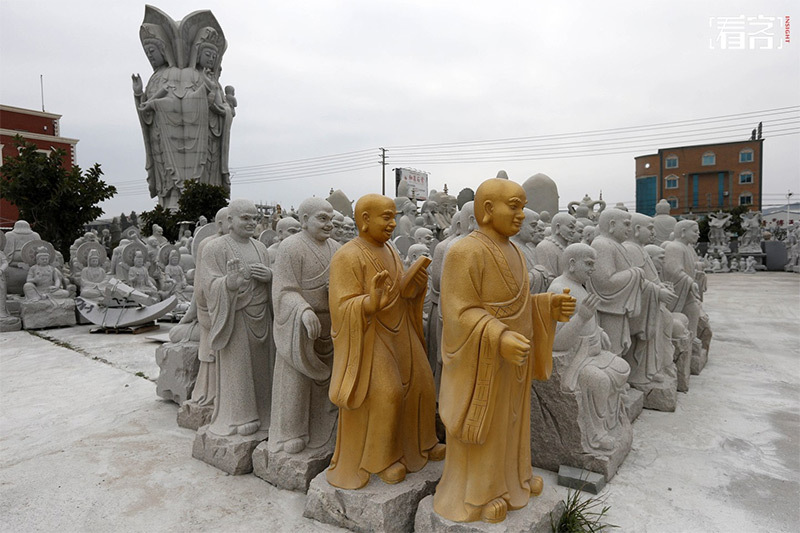 Here arrive stones of all kinds: marble, granite, sandstone and jade. 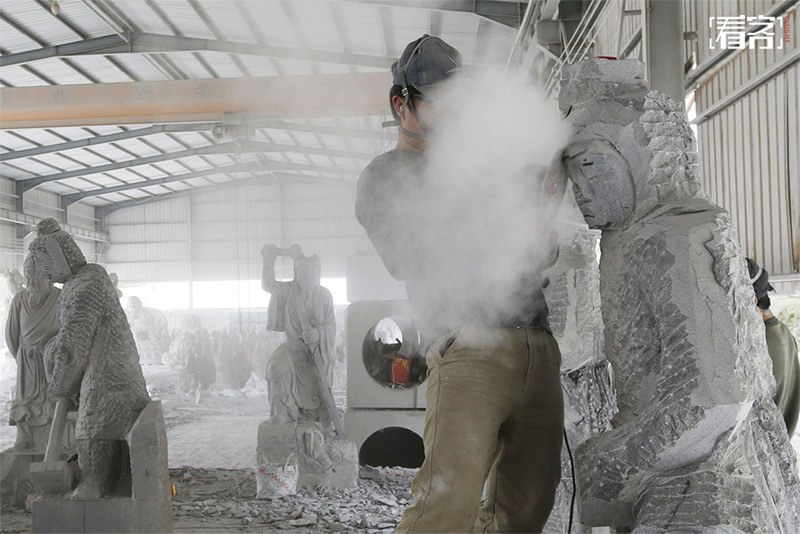 In Hui’an, stone carving is the most important business. 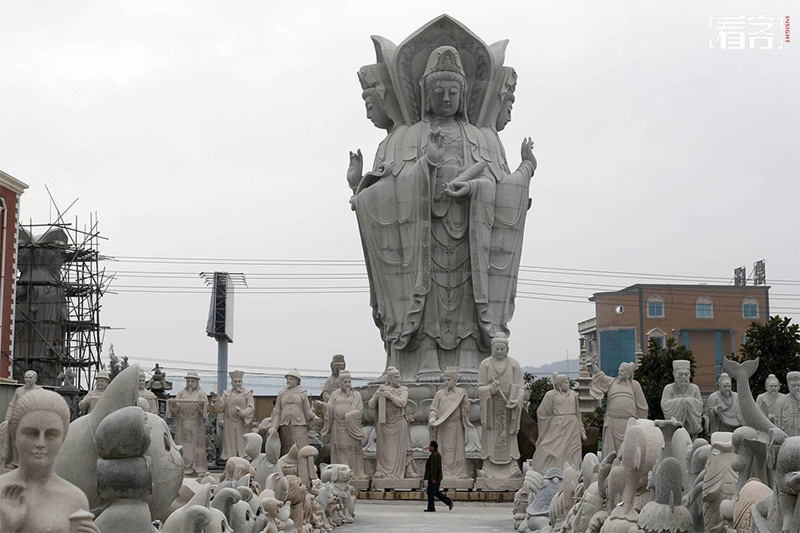 May 20, 2006, the State Council approved the inclusion of Hui’an in the first batch of national intangible cultural heritage. 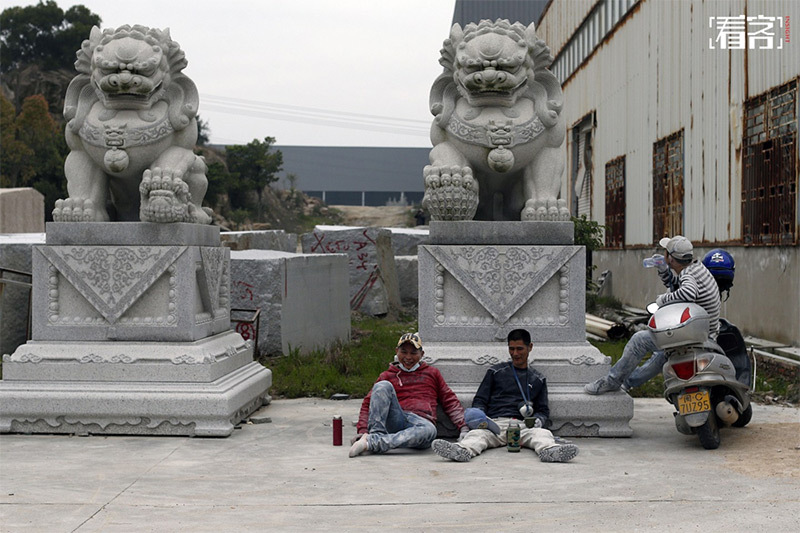 March 30, 2016 – Workers resting outside a factory. 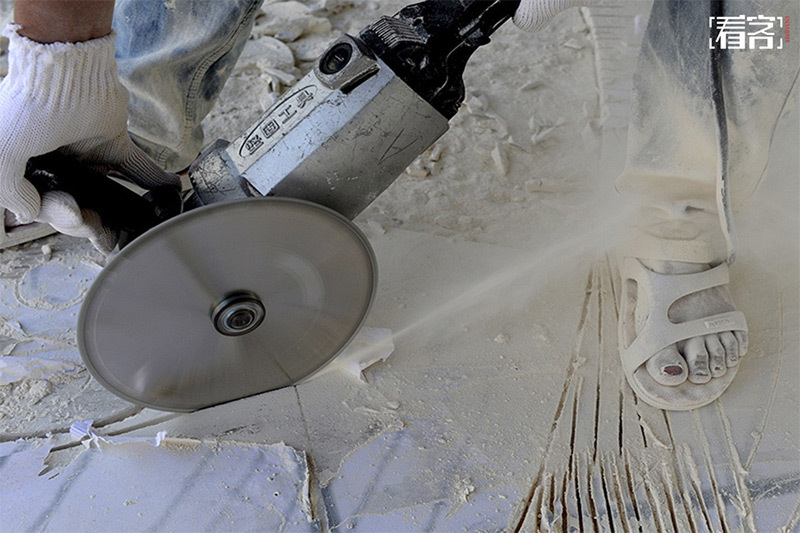 A worker diagnosed with pneumoconiosis. 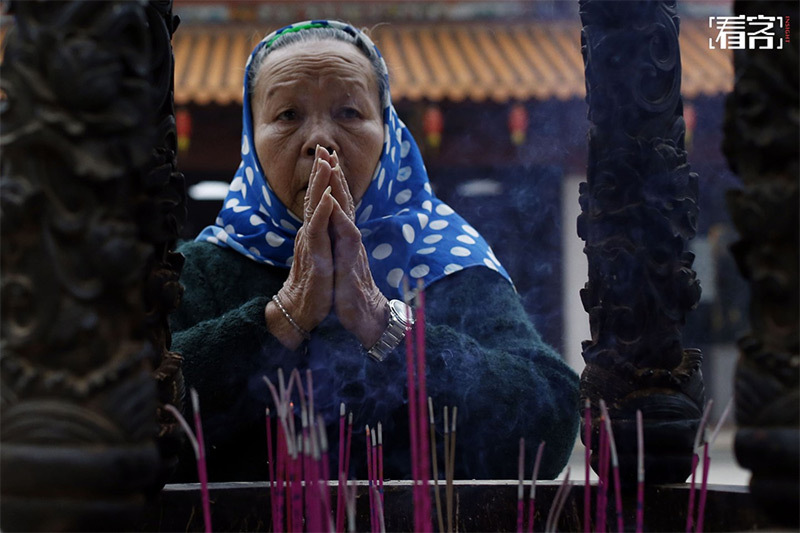 March 31, 2016 – A woman praying for peace in a temple in Hui’an. 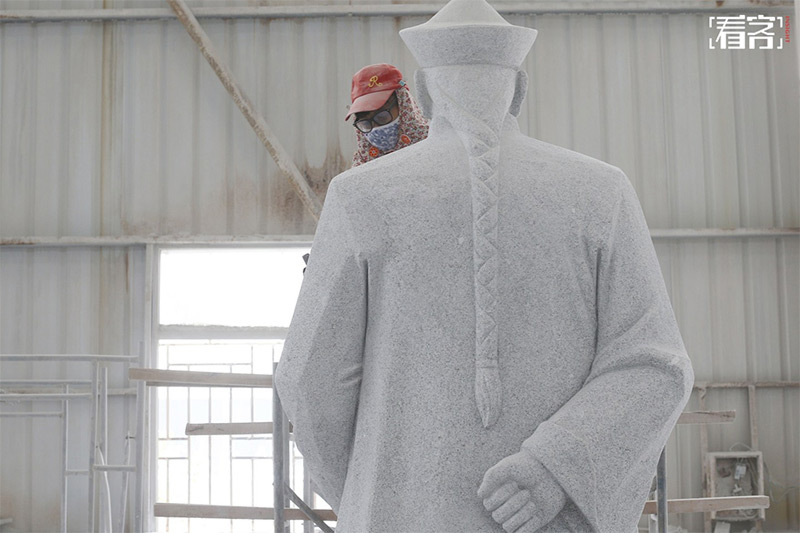 August 20, 2014 – A female worker blowing away dust from a statue. 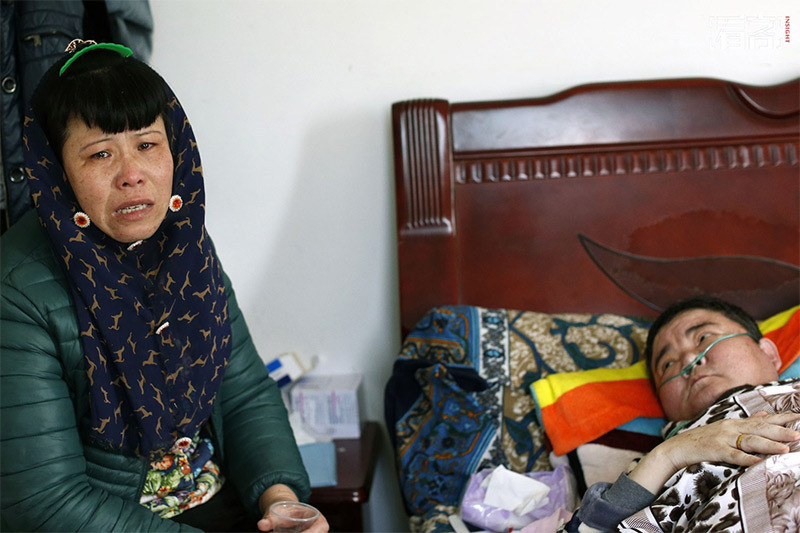 In other parts of China the situation is no different. 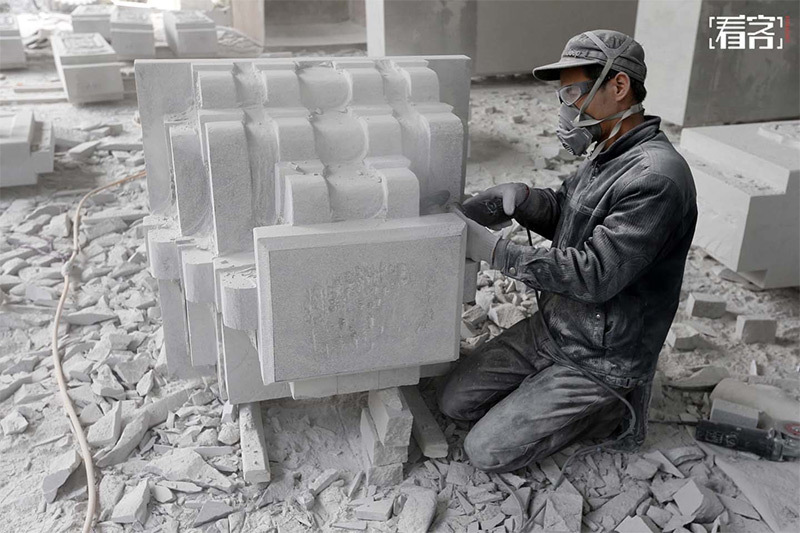 October 25, 2012, a stone factory in Quanzhou, Fujian Province, workers cutting stone. Cangnan, in Zhejiang, is nationally known recycled cotton processing base: the annual output value reached nearly 90 billion of RMB. 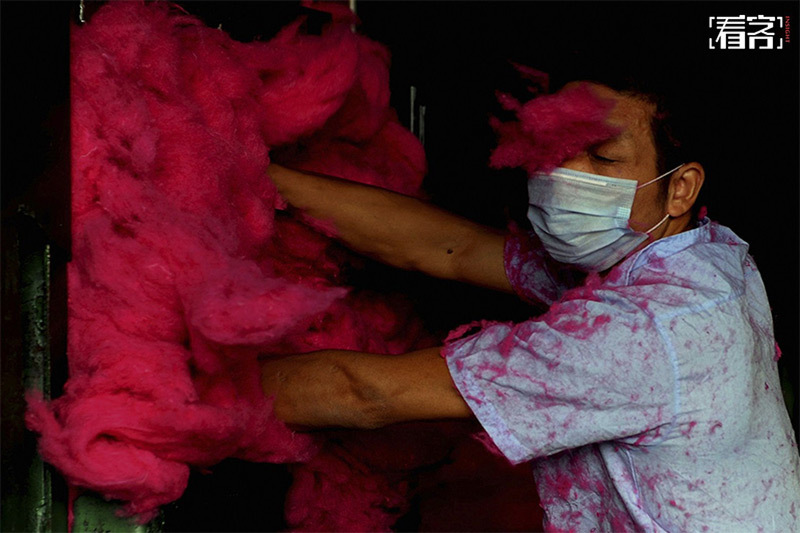 More than 95 percent of the country’s textile industry material expected to converge here: recycled cotton is processed into new colorful pet toys, rope yarn, sanitary ware, industrial fabrics, etc. sold around the world. Cotton recycling and processing has become an important pillar of Cangnan County. 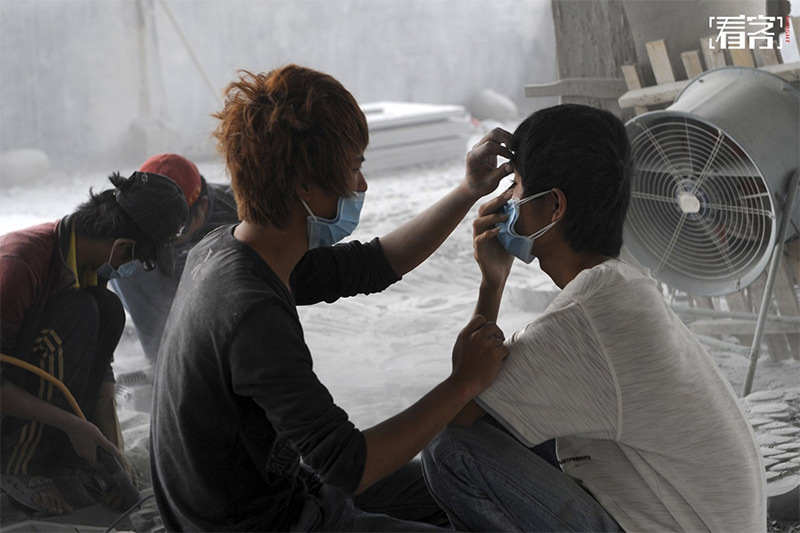 September 20, 2011, a worker’s eyes covered by dust. 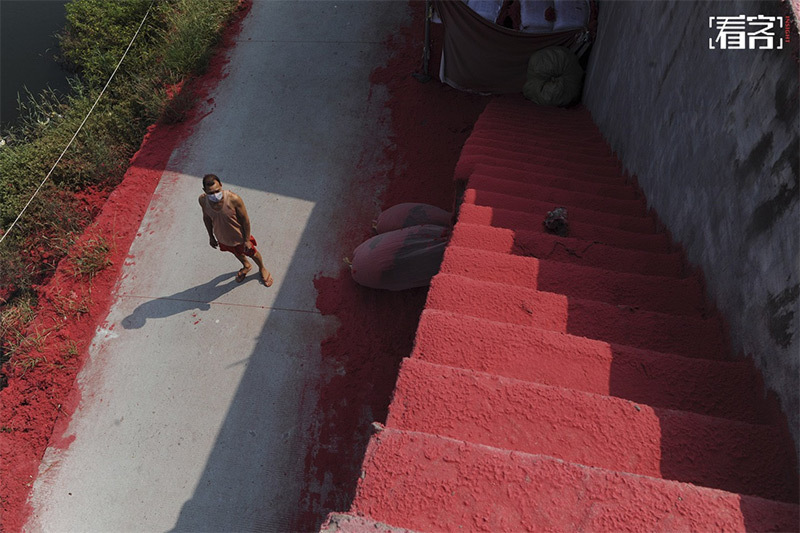 Many workshops use exhaust fan to discharge the waste and leftovers directly outside the plants, resulting in covering the nearby fields and hills with red cotton. September 20, 2011, Cangnan County. 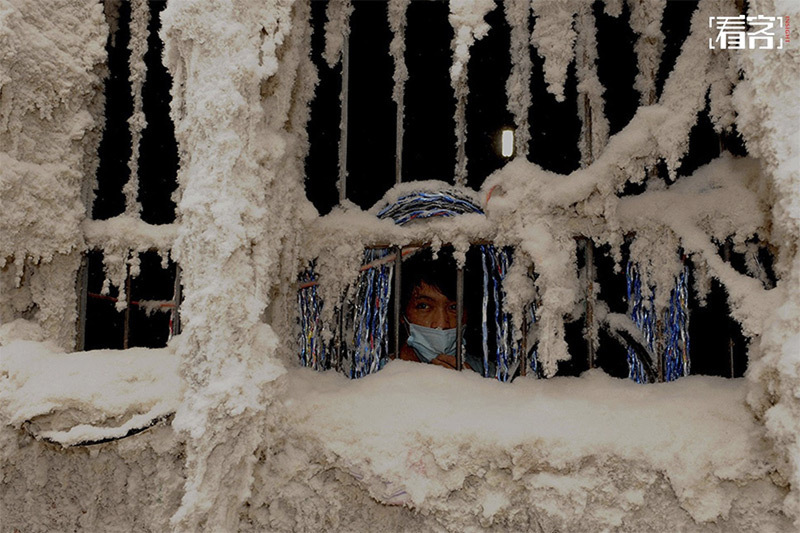 October 31, 2011 – A worker looking out through a window covered with cotton dust. 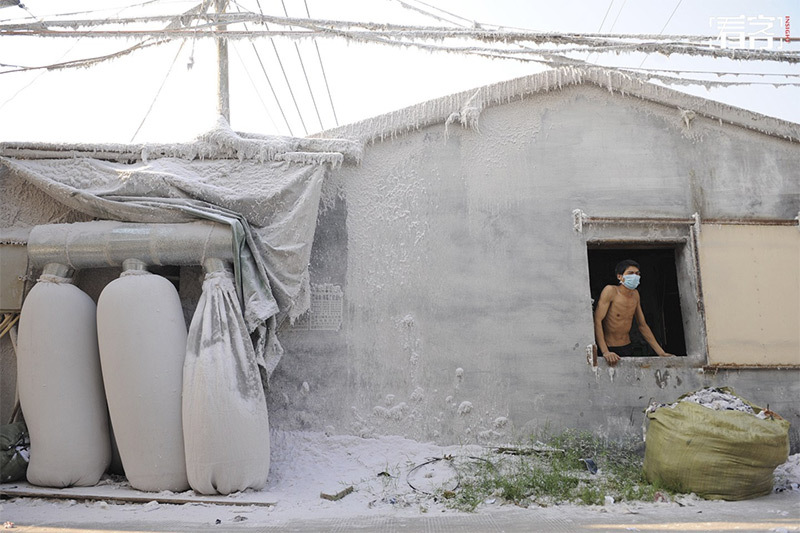 Because the air is full of visible floating cotton dust, many local residents wear a mask when they go out. 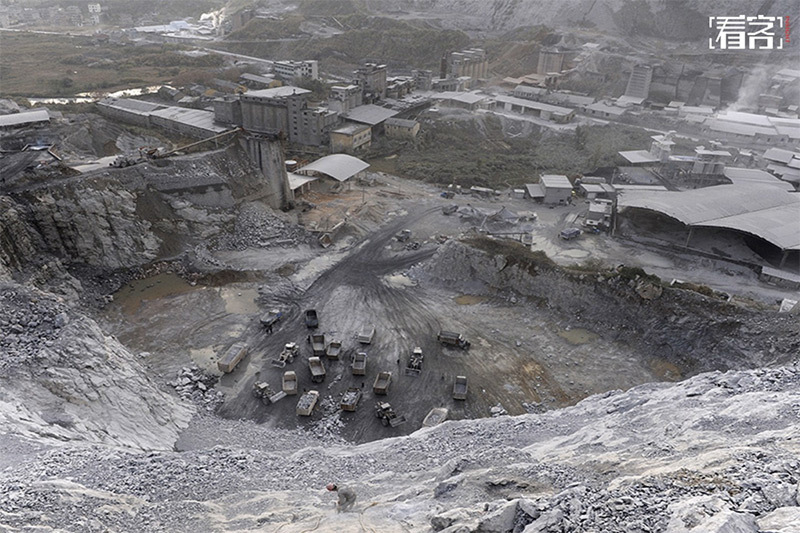 January 10, 2016 – A lime mine in Zhejiang. 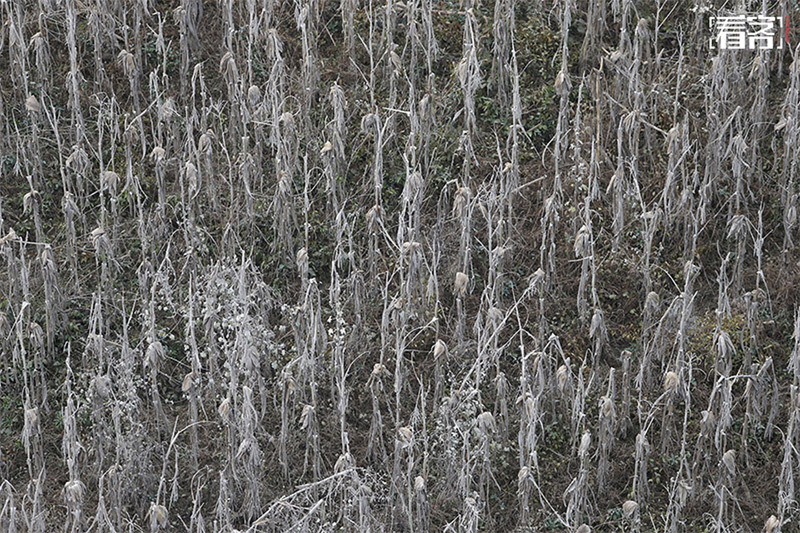 The harm caused by mine dust, lead to the death of crops. 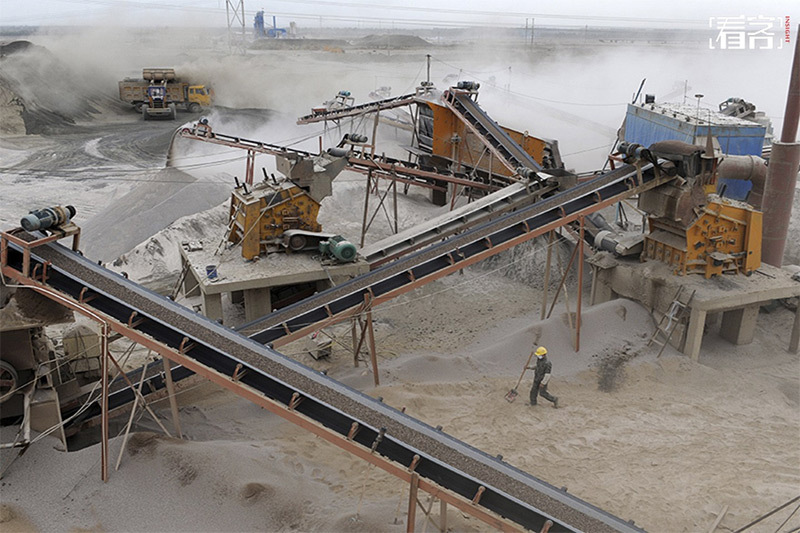 September 14, 2012, a gravel plant in Aksu, Xinjiang. September 14, 2012. 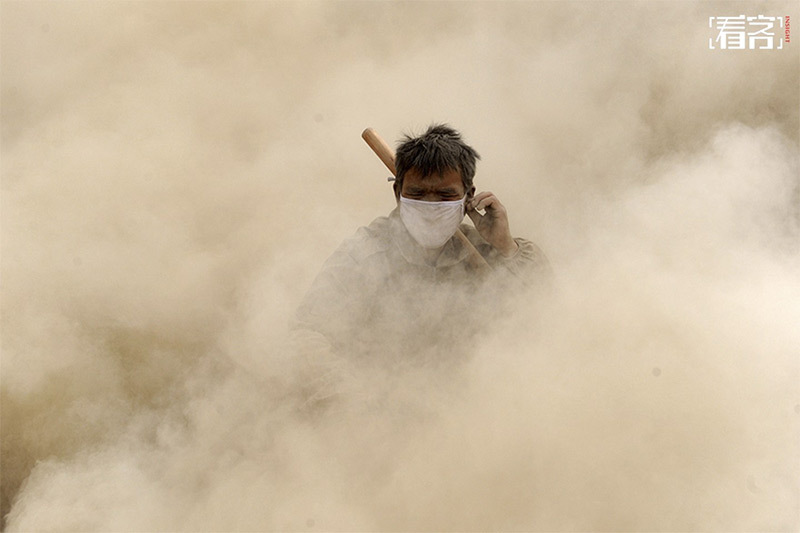 A worker in Aksu, surrounded by dust.